When back pain begins to affect your health, it’s time to take action. Traditional pain management relies on medication to “cover up” symptoms, providing short-term relief. For chronic cases, many patients believe that invasive surgery is there only option. However, our Sarasota chiropractor Dr. Abe Kozma believes that there are less invasive and more effective treatment options for lower and upper back pain. Our drug-free approach to back pain relief has helped hundreds of our patients live active lives. We can help you, too. Whether you suffer from lower back pain, upper back pain, scoliosis or sciatica, our chiropractor can help. Dr. Kozma starts by diagnosing the underlying cause for your pain. In many cases, an untreated auto accident, sports injury or workplace injury may have caused a misalignment of the spine. Regular wear and tear from daily activities can also contribute to a spinal misalignment. For example, long hour slumped over a computer screen damages posture, strains the muscles and may lead to a spinal misalignment. When the spine is out of alignment, the body is at increased risk for injury, illness, fatigue and pain. 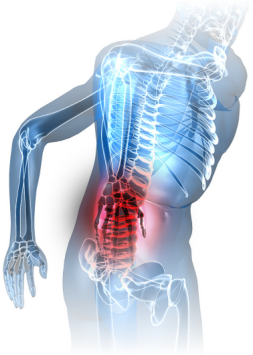 A herniated disc is one of the most common causes for back pain. When a disc slips out of position in the spine, it may compress nearby nerves, triggering a pain sensation. For example, if a herniated disc in the lower spine compresses the sciatic nerve, patients may experience lower back pain, as well as pain in the buttocks and legs. Identifying a subluxation in the spine, like a herniated disc, is the first step towards effective sciatica pain management. While medication can temporarily alleviate pain, it cannot correct a herniated disc or other mechanical misalignment. Correcting an underlying misalignment is essential to alleviating upper and lower back pain. Our chiropractor Dr. Kozma uses chiropractic techniques for adjusting the spine. These patient-proven techniques are safe, comfortable and effective. After completing a series of treatment sessions, our patients are more active, sleep better at night, and most importantly, experience less daily pain. If you have been diagnosed with scoliosis, chiropractic care may be able to help with this condition. A sideways curvature of the spine can be disabling and painful. Regular adjustments, as part of an ongoing treatment program, may help alleviate pain and support improved posture. Our integrated approach to treating back pain incorporates cutting-edge chiropractic care with complementary therapies that make a real difference for patients. Our physical therapy exercises and massage treatments complement adjustments and support whole body health. Don’t let lower or upper back pain compromise your health and stop you from living an active life. Contact our chiropractor today!